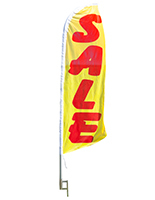 This sale here flag, is also known as feather banner, has a generic message for use at any number of establishments! The banner's message of 'SALE HERE' will entice passing cars to stop and enter your business to see what deals are being offered. 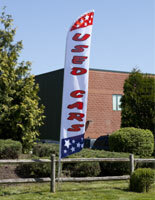 Each sale here flag has a red, blue and white color scheme, including stars and stripes to give this banner an American flag look. 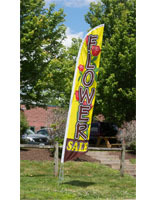 The banner display sign stands at 14' tall and 27"w. This sale here flag that is large brings attention on itself, when compared to a sidewalk a-frame. 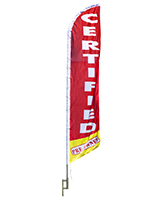 The feather banner is made from lightweight and wrinkle resistant polyester. Each sale here flag that is printed with dye sublimation has the logo 'dyed-through' so the mirror image of the graphic can be seen on the reverse side. 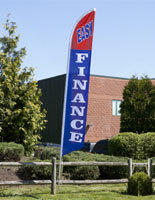 This ensures customers will see the colorful graphic no matter which direction the wind is blowing. 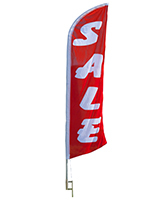 Each sale here flag comes with 31"h metal stake. The only tool required when setting up the pole is a hammer to drive the stake down into a soft or grassy surface. 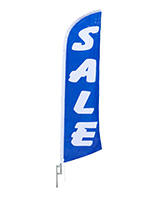 This sale here flag that comes with a ground stake is ideal for placement next to a road. 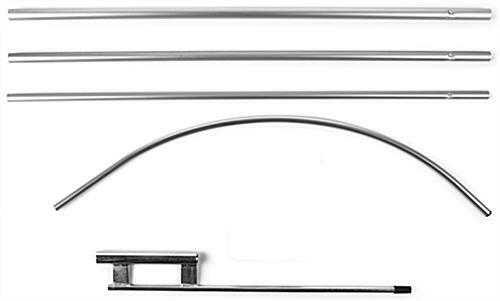 The 2' depth of the spike keeps the banner stable even in light to moderate winds. 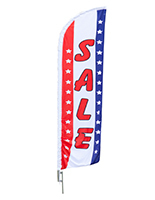 This sale here flag comes with an aluminum pole that keeps the banner outstretched. The feather banner easily swivels on top of the spike when it gets windy, giving the sign some give and allowing it to stay upright in the wind. 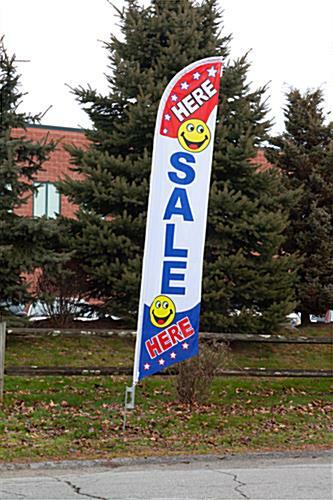 Each sale here flag is relatively inexpensive when compared to similar versions that include a fiberglass pole. This display is perfect for businesses on a budget seeking a competitive advantage without having to spend a lot of money.